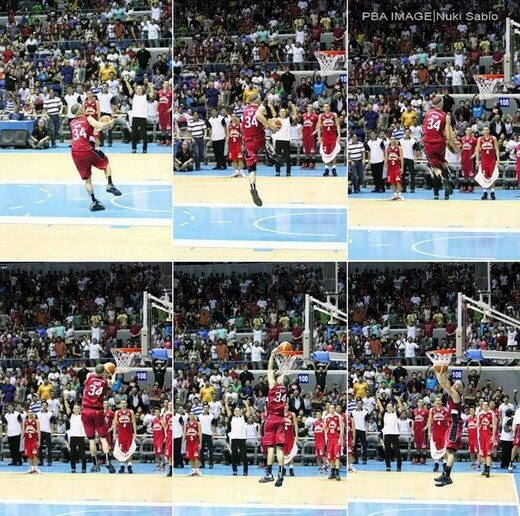 Chris Ellis Reverse Windmill Dunk Picture / Photo vs. Rain Or Shine: What A Dunk! It's been quite some time since I last saw a small forward in the PBA dunk like this. Imagine doing an in game reverse windmill dunk. Difficult right? But Chris Ellis of the Barangay Ginebra San Miguel (BGSM) made it happen. He is really a cut above the rest when it comes to dunking. His dunk is the icing on the 4 game winning streak cake of BGSM. They were able to defeat the Rain or Shine Elasto Painters via 97-90 a while ago. They came back from a 17 point deficit in the 3rd quarter to eventually win the game. Tama ka diyan! Mabuhay mga Kabarangay!